FKAB has secured a contract for the design of a 2,400m³ trailing suction hopper dredger (TSHD). The concept design was developed by the Ministry of Transportation and Communication’s Kaoshing Harbor bureau, which will own and operate the vessels. The order was acquired by the Ching Fu Shipyard. The company won the contract in competition with three other Taiwan-based companies. The Ching Fu Shipyard has commissioned FKAB for the basic and detail design contract based on the company’s experience and international standing in the shipbuilding industry. In order to improve the dredger’s performance, FKAB will review the concept design and provide the complete basic design package to the shipyard. FKAB will also deliver the detail design and related production drawings. In order to complete the commission swiftly and efficiently, FKAB has chosen Nupas-Cadmatic as their CAD/CAM system for the project. FKAB is part of the Swedish Mattson Gruppen, which is an independent engineering company mainly active in the marine and shipbuilding industries. With offices in both China and Sweden and over 50 years of experience, it has established itself as a reliable partner. To date FKAB has completed various dredging designs, ranging from backhoes, split barges and trailing suction hopper dredgers. Hopper dredgers are designed at the offices in Sweden as well as at FKAB’s Shanghai office. The Swedish office created the basic design drawings and the FKAB China office will carry out detailed and production design with Nupas-Cadmatic. FKAB has owned Nupas-Cadmatic licenses for some years, but up until now the Nupas-Cadmatic design work has been done at the Dalian (China) office. The Shanghai office will now use the licenses for the complete design and production engineering of the dredger. The power supply of the dredger will be provided by two MAN 6L21/31 1290kW main engines, three 6090AFM75 222kW auxiliary engines and a single CAT3512C 1118kW dredging engine. The power supply enables the vessel to dredge to depths of up to 25 meters. This is sufficient for its main task; clearing the Kaoshing Harbor (Taiwan), the fourth largest port in the world. FKAB chose Nupas-Cadmatic for the job based on its ease of use and intelligence. This combined with the open interface to other systems and the advantages of Nupas-Cadmatic’s eBrowser, convinced FKAB that Nupas-Cadmatic could reduce engineering hours used in development and production. This is particularly evident in this case as the Ching Fu shipyard also uses Nupas-Cadmatic. 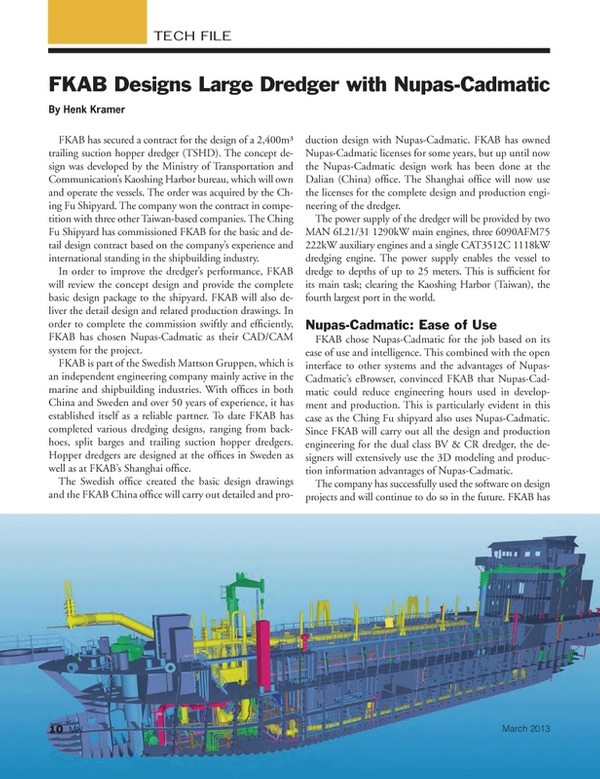 Since FKAB will carry out all the design and production engineering for the dual class BV & CR dredger, the designers will extensively use the 3D modeling and production information advantages of Nupas-Cadmatic. The company has successfully used the software on design projects and will continue to do so in the future. FKAB has particularly appreciated the Nupas-Cadmatic CoDesigner (a free of charge functionality in Nupas-Cadmatic V6.0 and up), which enables users all around the world to work simultaneously on a single project. CoDesigner makes it possible to add new design teams to a project with a few clicks. All object data is accessed via a check-in/check-out procedure that guarantees that only one designer can modify the same object at any given time. Simply by adding remote design teams to a Nupas-Cadmatic project, the project owner can decide which user has access to work on which sections in a ship. The owner can completely define how users can access the database environment. The owner thereby stays in control of the actions taken by subsidiary contractors, from the same company, especially when working with several subcontractors. CoDesigner allows FKAB’s Swedish and Chinese offices to work together on the same project at the same time. Before implementing CoDesigner they were able to work together on the same projects, but haven’t been able to do so concurrently. The use of CoDesigner means that projects don’t have to be shipped back and forth and sees data exchange reduced to a minimum. As a result, FKAB expects to save even more time and money while at the same time being able to draw on the knowledge of both offices. This allows FKAB to increase its effectiveness by seamlessly applying international know-how from multiple offices around the world. The trailing suction hopper dredger project is an example of how these companies intend to work together in the future. By fully utilizing know-how in collaborating shipyards, design offices, subcontractors, project owners and clients, the parties expect to gain a competitive advantage.